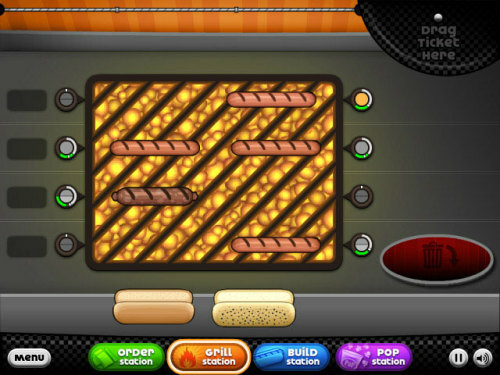 Description Grill and serve hot dogs and other stadium snacks in Papa’s Hot Doggeria! You’ve got the best seat in the house at Griller Stadium, which happens to be behind the counter at the hot dog stand. You’ll need to grill dogs and sausages, add toppings and condiments, pour drinks, and pop popcorn for all of the fans at the game! Use the mouse to take orders, grill hot dogs, add condiments, and prepare drinks and popcorn. Follow the in-game tutorial for more information.